Challenge Days are powerful, high-energy programs in which youth and adult participants are guided through a series of experiential learning processes. The overall goals of the program are to increase personal power and self-esteem, to shift dangerous peer pressure to positive peer support and to eliminate the acceptability of teasing, violence and all forms of oppression, as well as suicide, alcohol and drugs. The Challenge Day Program is designed to unite the members of the school or community and to empower them to carry the themes of the program back to the school populations, while the Graduation Challenge Day includes a component of readying the graduating class for the next chapter. 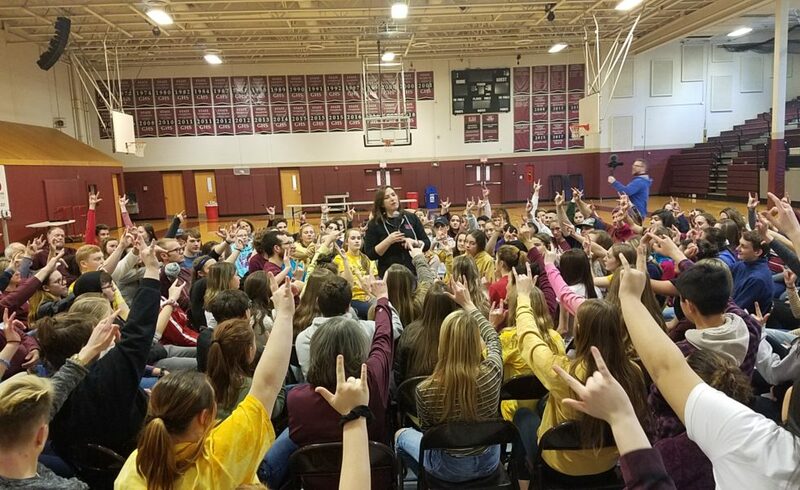 This is the second year in a row that we have sponsored this amazing program for the students of Goffstown High School and we couldn’t be happier or more grateful to be able to bring such an impactful, extraordinary program to our kids. Thank you to our donors and sponsors for the support that makes this work possible. For more information on Challenge Day, visit www.challengeday.org. To help make programs like this possible, click on the Donate button to the right. Thank you!